We had the excitement of seeing our first worm of the season yesterday. I was so excited when I saw it and the kids squeals of delight made this mama heart happy. I find great pleasure in seeing them enjoy and explore nature. I’ve been planning a second part to our worm unit study for later this spring, but I may just have to bump it up a few weeks. 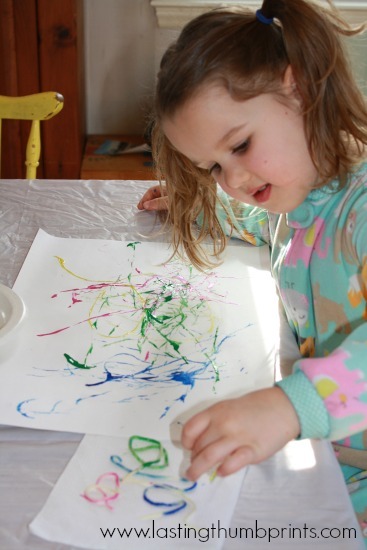 I wanted to find a way to combine their enthusiasm for finding the worm and several requests to paint together. 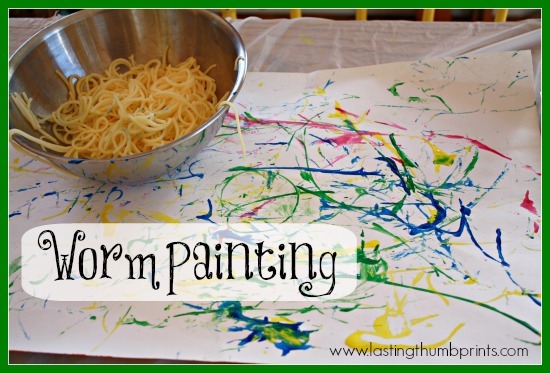 Then I remembered seeing ideas for using pasta to paint. 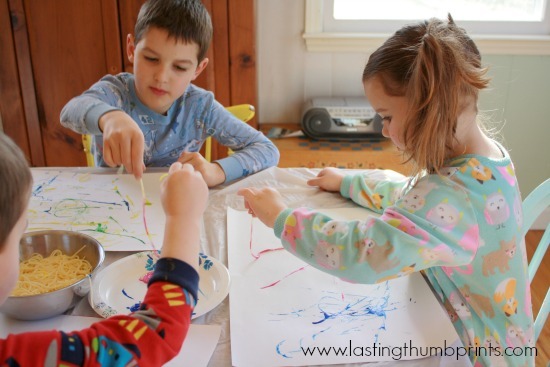 This is a great sensory art experience that I knew my children would enjoy. So I grabbed some worms cooked some spaghetti and got ready to make a lovely mess with my kiddos! I used washable paint because it’s what I had on hand. And also because I believe in washable anything in this house. 😉 I also used 12″x18″ paper so the kids had more surface area to drag the “worms”. I have to admit that I loved it when my kids sat down at the table ready to paint and asked where the paint brushes were. 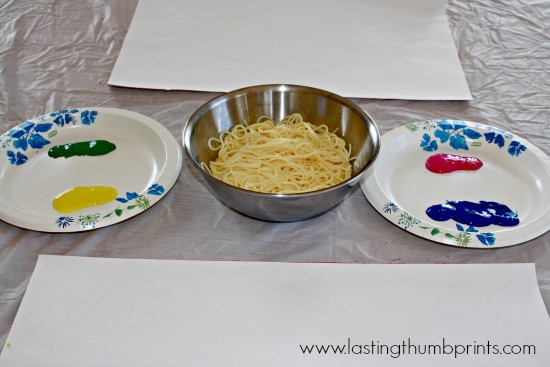 But I loved watching their faces even more when I told them we were using the spaghetti to paint. Clearly it’s been a long time since I’ve done something out of the ordinary. This sensory art project was a huge hit with my children. My three year old did not want to give that bowl of noodles up when we were finished. It was too much fun squishing those noodles around! And I cooked extra spaghetti noodles to use in broccoli & cheddar soup tonight, yum. If you’re planning to study worms, you might be interested in checking out the resources in the worm unit study we did last fall. And if you’re interested to see what new worm projects we’ll be doing this spring, be sure to sign up for free email updates so you don’t miss any future posts! I am thinking that painting on those pieces of paper used in packing would make great and fun gift wrap. The bright colors on your pictures made me think of how fun those would be for wrapping presents. Worm painting! How fun! So creative and a great memory maker. Thank you for sharing.